MPL's Railway Computer product range has been further expanded with a powerful i7 Quad Core solution called RAIL-PIP39. Based on customer requests, the solution has now been successfully tested according the EN50155 Standard (Railways Applications Electronic Equipment used on Rolling Stock). The new RAIL-PIP39 Intel i7 Quad Core solution is based on the PIP39 that is already being used for various applications in rugged and tough environments. For the temperature tests, the Class Tx has been chosen, which means -40°C to +70°C and +85°C for the duration of 10 minutes. For shock and vibration test, Class 2 (Bogie mounted) has been selected which is the second most severe vibration test standard in the railways industry. For test report, please contact MPL directly. • Availability of 19" rack solutions (2U -4U) . MPL Solutions are modular designed and therefore can be easily expanded and customized to meet various customer needs. The LAN ports come on M12 (D-coded or X-coded). The same applies to the input power. The input power ranges from 9-36VDC, 18-48VDC, or 60-163VDC. The devices can also be equipped with redundant power input. Nearly any additional functions can be integrated over the various expansion buses on the PIP39. Combined with the other Railways certified Embedded Computer Solutions, MPL now offers from a low end Intel Atom up to i7 Quad Core CPUs. (all with the long-term availability program from MPL). To complete the Railway product portfolio, MPL also offers EN50155 certified firewalls (GUARD-F12) and switch solutions. (MAGBES & MAXBES). 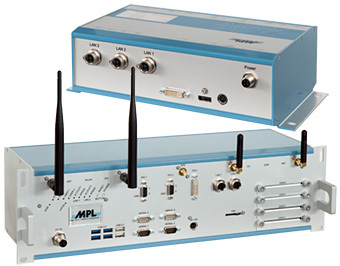 MPL can provide you with a complete solution for your train applications.